Play ball in Johnston County, swim or run a triathlon...we have the facilities to host your tournament or event! Baseball, football, basketball and soccer are traditional sports facilities for the communities of Johnston County, with tournaments held in the county all year round. Today, the county also hosts tournaments for Bocce Ball, gymnastics, wrestling, triathlons, and swim meets, just to name a few! 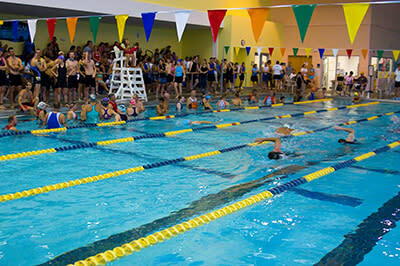 Sports organizers will find two community and sports complexes at the Clayton Community Center and the Smithfield Recreation & Aquatics Center...both eager to accommodate your next sporting event. For more information on different sports facilities in Johnston County, contact our Sports & Leisure Sales Manager, Sarah Elizabeth Lagasse at 1-800-441-7829.